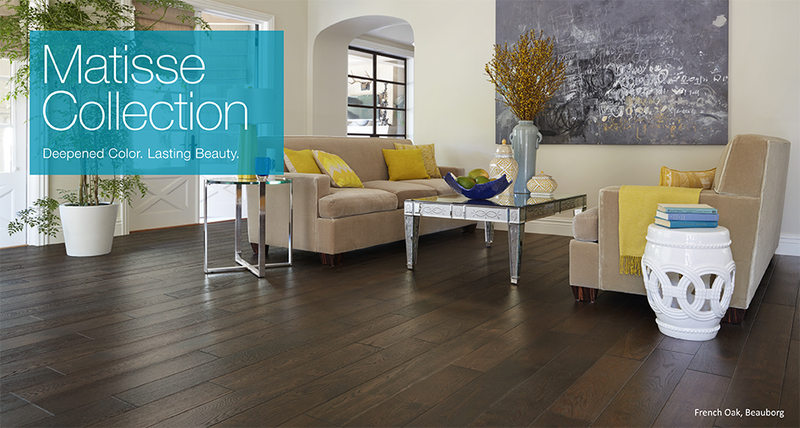 What the “painter of color” did for Impressionists, the Matisse French Oak Collection now reinvents for hardwood. Matisse sets today’s new trend with unrivaled vibrancy in its color patina and depth of shine. Credit goes to an unprecedented multi-step smoking process—color craft only patient, meticulous artisans can elicit. Choose from a range of designer hardwood colors and, as complementary shades of fabric, walls and natural light play upon it, color variations spring forth to dazzle the eye. Matisse floors feature a premium finish chosen to preserve smoke-deepened shades, for beauty that both inspires and endures. Color your world magnificently with Matisse hardwood.